Kumamoto (Japan) (AFP) – Scores of people were feared buried alive Saturday after two powerful quakes hit southern Japan a day apart, killing at least 32 people, and as a forecast storm threatened more devastating landslides. Homes, roads and railway lines were swept away when huge hillsides collapsed, as thousands of tonnes of mud was dislodged by the thunderous seismic tremors. Buildings were reduced to rubble, including a university dormitory and apartment complexes, with dozens of people unaccounted for over a wide area. “We are aware of multiple locations where people have been buried alive,” chief cabinet secretary Yoshihide Suga told a press conference. Around 70,000 people have been evacuated, including 300 from an area close to a dam thought to be at risk of collapse. A hospital was left teetering by Saturday morning’s 7.0 quake, with doctors and patients rushed from the building in darkness. 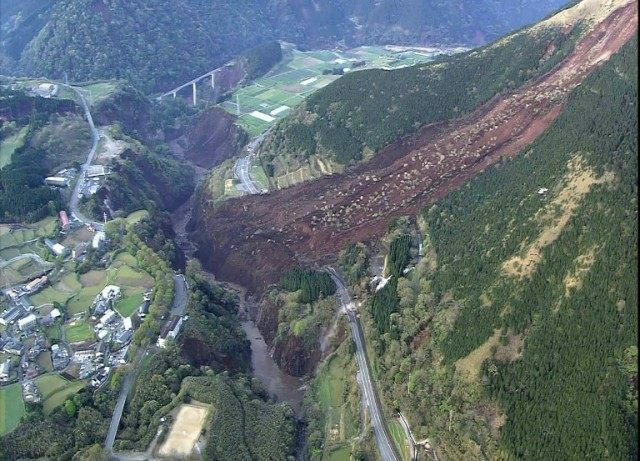 Isolated villages in the mountainous area of Kumamoto were completely cut off by landslides and damage to roads, with at least 1,000 people believed trapped in one area alone. Aerial footage showed a bridge on a main trunk road had crashed onto the carriageway below it, its pillars felled. The quake came as emergency responders were working to reach areas already affected by a 6.2 magnitude tremor that struck late Thursday. Adding to worries was the eruption of a nearby volcano, although seismologists cautioned there was no evidence of a link and said activity was limited. Aftershocks continued to rock Kumamoto and its surroundings, an area unaccustomed to the powerful quakes that regularly shake other parts of seismically-prone Japan. Thursday’s initial quake affected older buildings and killed nine people, but Saturday’s brought newer structures crashing down, including a municipal office in the city of Uto. “The total number of deaths rose to 32,” Yumika Kami, a spokeswoman at the Kumamoto prefectural government, told AFP. Tokai University announced that two of its students, who were among around a dozen trapped in a dormitory building in Minami-Aso, were now known to have died. In nearby Kumamoto city, an AFP journalist said he was jolted awake by powerful shaking, which sent the television set in his hotel room crashing to the floor. Staff urged guests to evacuate. Kumamoto airport was forced to close after a ceiling collapsed, Jiji Press reported, with no immediate plans to resume flights, and communications in the area were spotty. Prime Minister Shinzo Abe announced he was sending 20,000 emergency responders to the area, including troops, firefighters and medics. “From tonight, we are expecting rain and winds and deteriorating weather in the Kyushu region,” he told a press conference. “There are fears of possible landslides and other secondary disasters. Japan, one of the most seismically active countries in the world, suffered a massive undersea quake on March 11, 2011 that sent a tsunami barreling into the country’s northeast coast. Japan’s only working nuclear plant, which is southwest of Saturday’s quake epicentre, was unaffected, the government has said.